The Berkeley students found that the highest level of traffic crossing the Greenway occurs during the afternoon peak between 2:30 and 5:30 p.m., followed by the morning peak between 7:00 – 8:00 a.m. Having safe ways for children to walk and bike to local schools in the Greenway vicinity can relieve traffic at busy times. 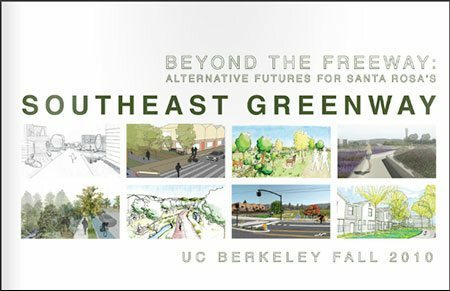 In the fall of 2010, ten talented graduate students from UC Berkeley’s Urban Design Studio, with expertise in urban planning, landscape architecture, traffic planning and traffic engineering, adopted the Southeast Greenway as their studio project. Under the direction of Michael Southworth, Professor of Urban Design and Planning, the students prepared an analysis of current site conditions. Using this information as their foundation, the students developed a series of creative plans for the Greenway, each capturing their unique vision. On December 11, 2010 the students showcased their work in a presentation titled “Beyond the Freeway: Alternative Futures for Santa Rosa’s Southeast Greenway”. The presentation drew 150 people at Santa Rosa’s Glaser Center. The attendees engaged with the students in small groups and left with many ideas about how a Greenway could benefit our community.